Lawton's Family Farms, also the home of Foxboro Cheese, is a terrific little stand that shows up once per week at the Dewey Square Farmers Market. Along with delicious cheese (try the Asiago! ), they also often have a selection of their own grass fed beef, sausages, and if you're lucky, there's also a few select cuts of their own veal. It's truly a treat, and just an FYI, the beef at this little stand is just slightly cheaper than a few of the other stands at the farmers market. My favorite cut of veal to purchase from the stand are the veal chops. The good people at this farm pride themselves on properly raised animals that produce their milk, which you can also pick up as raw milk from the farm stand on premise at the farm. (Unfortunately, there is pending legislation that is taking its damn time in allowing for them to sell raw milk at the farmers market.) Regardless, the veal at this farm is milk fed, and has a ready supply of grass for grazing. They're not pent up in crates, but allowed to roam outside daily, making for happier animals and tastier meat. 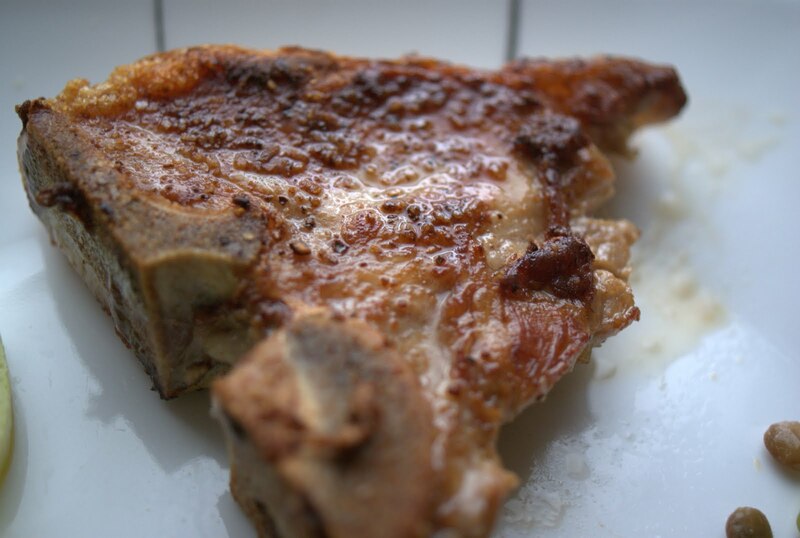 The other day, I picked up two small veal chops at about four dollars per piece. The kind lady at the farm stand asked if I had prepared their veal before, and when I said yes, she graciously sent me on my way. Preparation of the veal is just about as easy as it gets. Defrost the meat, salt and pepper both sides. 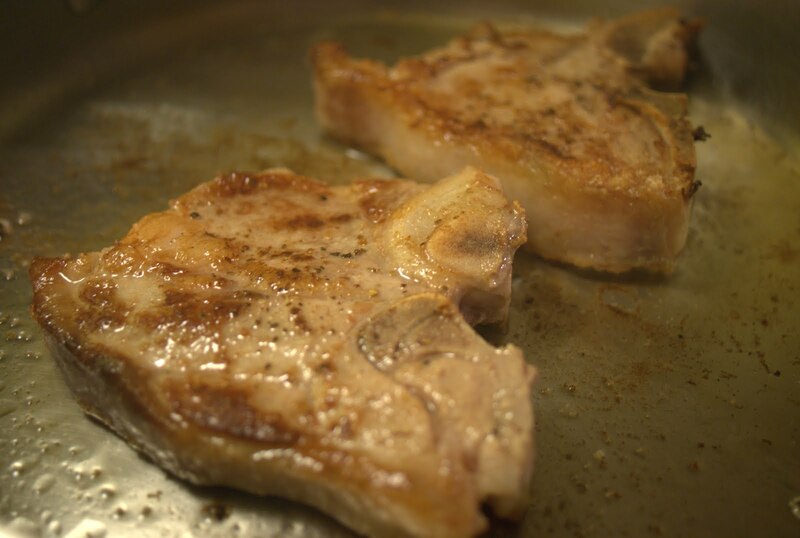 Pour about a tablespoon of canola oil into a hot frying pan, and gently place in your veal chops after the oil is ready. It'll take all of about three minutes on one side, and then three minutes on the other side. The meat will sizzle, and form a beautiful crust on the gentle, pale beef. When it's at nice medium, perhaps still slightly pink in the middle, your chops are ready, and you can remove them to rest on a cutting board for about five minutes to allow the juices to redistribute. 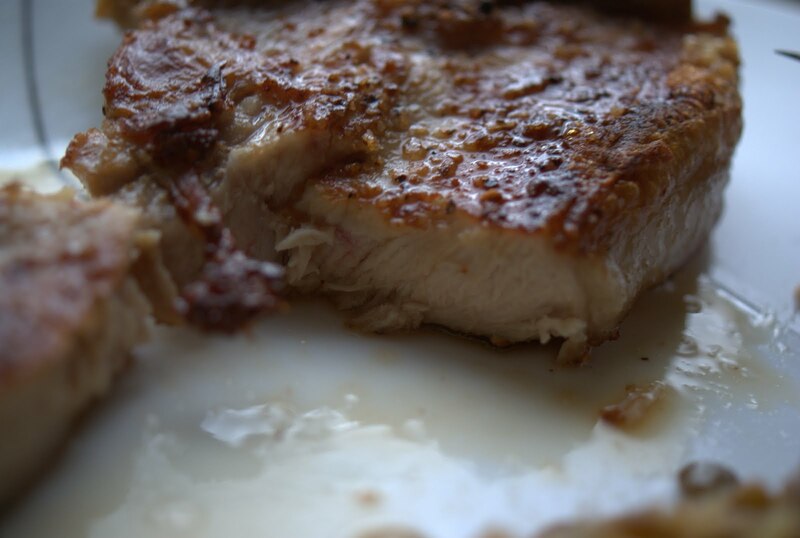 When you take a bite of this veal, you'll immediately notice how delicate and tender the meat is. It is fork tender, and the succulent juices will coat the inside of your mouth. These young bovines have been taken care of. Having only been fed on small amounts of grass when they felt peckish and generous amounts of milk, the meat has not been given a chance to grow deep red and tough. It's almost more of a pork flavor than that of a heavy steak. After peeling through all of the meat, one of the most pleasurable parts of enjoying the chop is to grab the little bone and start gnawing at every last bit of succulent, tender veal. It's fabulous, and fancy. Veal that is raised humanely is really a testament to how delicious beef can be. Kudos to you, Lawton's Family Farms! Look for the large Foxboro Cheese sign, ask the nice lady at the stand if they have any veal available, and give their meat a try the next time you stop by the farmers market.